1. In a large nonstick saucepan, cook the bacon over medium heat, turning until crispy and the fat has rendered, about 5-7 minutes. Set the bacon aside to drain and keep the pan on the heat. 2. Add the red onion to the bacon fat and sprinkle with kosher salt. Cook until golden brown, about 5 minutes. Transfer to a small bowl, keeping the pan on the heat. 3. Add 2 tsp.s olive oil and the Brussels sprouts. Cook the sprouts on high heat for about 2 minutes until starting to brown and the pan is drying up. Add the chicken stock. 4. Cook the Brussels Sprouts about 5 minutes until just tender and the broth has cooked off. Add the onions back in and toss together. Season to taste with kosher salt and black pepper. 5. Transfer to a serving dish. 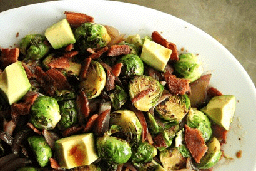 Crumble the bacon over the sprouts. Add the chunks of avocado. 6. Drizzle balsamic vinegar over the top of the dish. Serve warm and enjoy!